We’ve seen so many Old Hollywood actresses posing demurely at their vanities, tweaking their hairdos or adjusting their makeup. Today, let’s do a little something different. 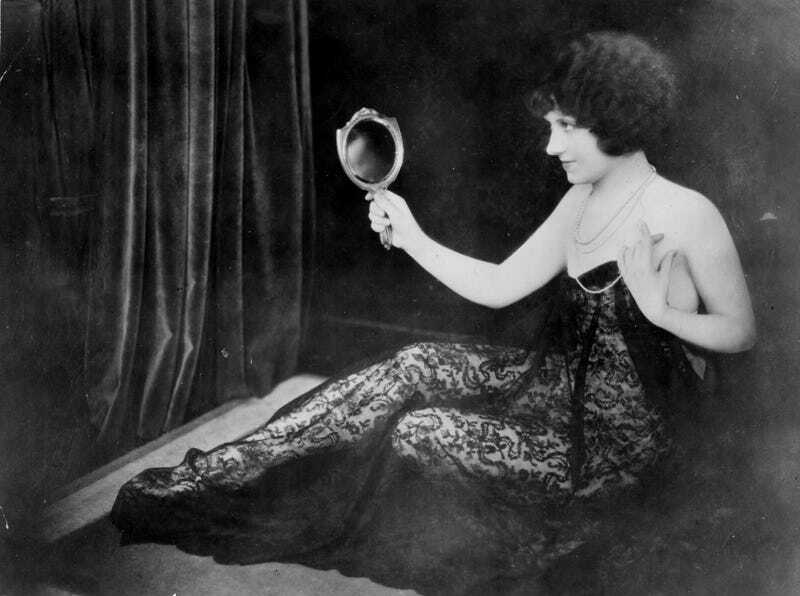 This is Estelle Clark, circa 1924, “as she appears” in MGM’s So This Is Marriage? According to the very scanty IMDB entry for the silent film, she played a maid. (Tagline also via IMDB: “Don’t Change Your Husbands When Crossing the Stream!”) No idea why a publicity shot for somebody playing a relatively minor character is still floating around Getty Images. And your guess why she’s so scantily dressed is as good as mine; according to Wikipedia nobody’s seen a copy since a 1967 vault fire at MGM. Photo via General Photographic Agency/Getty Images.